Masterpiece Dinobot showed up to monopolize my world just before I could get to talking about Power of the Primes Predaking, but now that MP Dinobot fever has died down a smidge, I'm ducking back to those simpler, more primitive pre-MP Dinobot times. So, yeah, it's TITAN CLASS Predaking! Titan Class is that once-a-year size class that costs $150 and bounces back and forth from being an irregularly-formed combiner (Devastator) to city-sized guys (Metroplex, Fort Max, Trypticon). Predaking is the second combiner, and he's an awful lot like Devastator, the first! Just, like, construction-wise. He's composed of giant blocky dudes who are clearly just pieces to make a cohesive 18-inch-tall robot. It's the same feel all over. 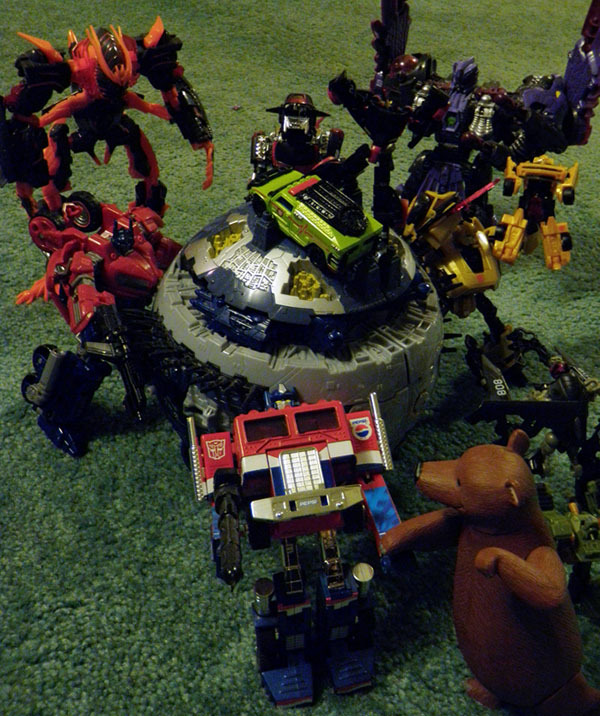 If you have Devastator, you know generally what to expect with Predaking. Predaking's a little less fortunate in this respect, though, because his individual components are ANIMALS. Unlike construction vehicles, which are essentially blocks already, animals are, like, you know... animal shapes. And so Predaking gives you... some blocks with tiny heads and legs on them! They're animals! Sort of! I mean, this didn't matter to my toddlers, who looked upon these blocky creatures with a sense of frenzied wonder, but a more older-type person might be a little dissatisfied. For example, the monstrously lengthy thighs of the combined Predaking robot ... just kind of hang underneath the bull (Tantrum/Torox) and the rhino (Headstrong). Those are the two bulkiest animals (in real life), so they're the best choices to go with if you need to have two giganto plumpo creatures, but it's still a visible compromise. Divebomb, the ... bird... is also pretty bulky, because he splits in two. Half of him becomes an arm of the same girth as the other arm, Rampage (tiger). The rest of him is, well, it's half of Predaking's torso. It's his taint and his stomach and his spine and his wings, with Razorclaw (lion) forming the chest. So Divebomb's a pretty massive bird! Chunky! But, again, the combined robot is the main event here. Everything else is subordinate. And the combined robot is pretty good! I like it! It holds together and can do stuff and it looks nice. And so that's how I'll likely display him, and it probably won't matter that he's made out of the blockiest jungle creatures ever seen. The set comes with a sticker sheet, same with previous Titan Class offerings, but, oh my lord, the sticker material isn't terrible this go-round. Like, you can remove stickers from the sticker sheet without the stickers TEARING DOWN THROUGH THE MIDDLE OF THE STICKER instead of, like, you know, where the actual perforations are. And the material is strong enough you can actually remove and replace stickers if you have trouble putting them down, so long as you're careful. And there's minimal putting flat stickers over sculpted detail. That's nice. Oh, and Predaking comes with a Prime Master figure of Onyx Prime, which is the only way to get an Onyx Prime. So, uh, hopefully if you were completist with those you were already planning on getting this guy. Anyway, summing up: Good big robot. Smaller guys are an acquired taste. A small step forward in sticker technology in this year of 2018.